Stump Removal Service is the number one choice for your stump grinding needs that pose a hazard to your property. Grinding those stumps on your property allows for effective repair and replanting of the area and also ensures that none of your family are at risk with a potential hazard either. We provide tree and stump removal for any size tree. 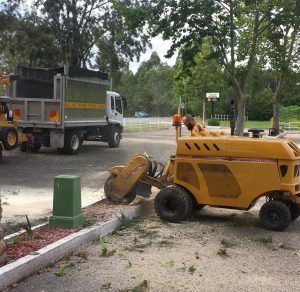 Though we will travel all throughout Sydney, we especially provide stump removal service to the greater west, north and south coast. We can remove your stump at the time of your tree removal, or you can call us at a later date for stump removal. Using the top of the line equipment we can remove any stump from anywhere on your residential or commercial property. With a variety of machines that are made for stump grinding effectively, we can handle even the most stubborn stumps. If you have an extremely large sized stump or one that is located on a hill or a stump that is in a narrow opening we will handle it. We can leave the wood chips piled up from the tree stump for you to re­use as mulch, or haul them away. Tall Timbers Tree Services will work with you to understand your long and short-term plans for the area and will give you recommended options. Our customer's intention for the new yard opening where the stump is removed will determine the specifications regarding how the stump will be removed. This will include how wide and deep to grind the tree stump roots. If a customer intends to re­plant another tree then the tree stump roots will need to be completely removed. Stumps are the leftover or more precisely the bottom edge of the tree after cutting. These stumps protrude from the ground and are very dangerous as they can cause serious injuries. They also look awkward and can destroy the beauty of the land. In many cases, it is better to remove the stump to make room for another plant, maintain the exquisite surroundings and reduce the chances of injury. Even though the stump is protruding, the roots are still deep underground. In this matter, extra precaution must be taken before starting the stump grinding process. Otherwise, it could cause damage to the ground and increase the cost of repairing the area. To remove stumps quickly and easily, resort to expert Stump Removal Service the best stump grinding service for this sensitive task. 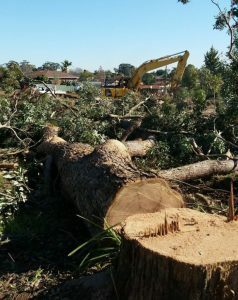 Tall Timbers Tree Services is the best stump removal service providers in the area. We utilize powerful machinery that allows us to complete the job with a hundred percent accuracy and safety. We respect our client’s time and always try to complete the task in the time frame stated. Our well skilled and expert labor team make it possible to satisfy our customer by following the direction of supervisors provided by the company. While doing this we fulfill commitments with clients and our customers are always satisfied with our services. 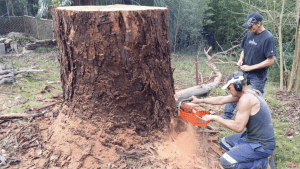 To know more about Stump Removal Service, how to remove stumps quickly and easy, read our Stump Removal Service article. For all your stump removal needs, call Tall Timbers Tree Services for a free quote today!